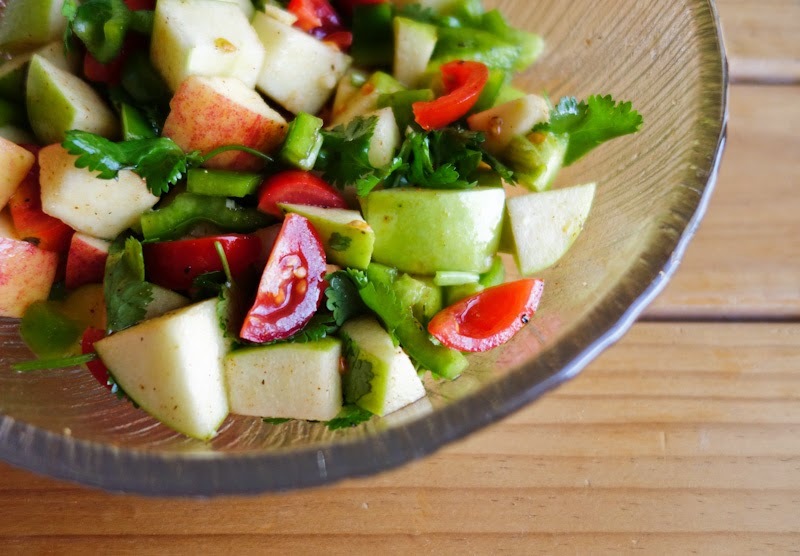 A smoky, savoury apple salad. I promise the next post won't be a salad recipe, but for now, I hope you are tolerating (and even enjoying) my recent run of salads. I'll put some of the responsibility/blame on Simon - I was chopping up apples the other day and had all the intentions of making an apple dessert. He insisted that he wanted a salad and I gave in. On the bright side, it's nice that he is trying (with some success) to lose weight. Plus, given my appreciation for fruits and vegetables, it is really quite a good thing to have a boyfriend who likes salads. Right? Right? So here we go... a simple, savoury apple salad that I created on a whim. 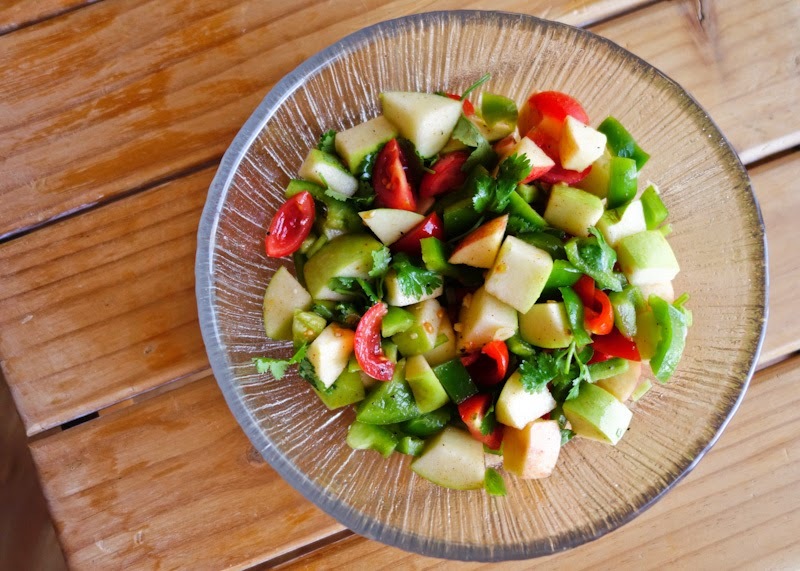 The apples provide sweetness while the green capsicum pleasantly counterbalances that with a hint of grassy bitterness. The tomatoes add juiciness, while the lime juice keeps everything fresh and tangy. Garlic, smoked paprika and coriander leaves impart piquant, aromatic touches. This salad is easy to make, and it's easy to eat, too. Mix lime juice, extra virgin olive oil, minced garlic, smoked paprika, cracked black pepper and salt in a salad bowl. Chop apple(s) and capsicum into bite-sized pieces, discarding the stems, cores and seeds. Cut cherry tomatoes into quarters or sixths. Place the pieces of fruits and vegetables in the bowl. Add the coriander leaves. Toss everything together to combine the ingredients. It's preferable to let the salad rest in the refrigerator for at least 20 minutes to allow the flavours to mingle, and if you do so, toss the salad again just before serving. Healthy apple salad. Also vegan and gluten-free! Sounds wonderful! I must give that a try. I'll probably use chipotle paste instead of smoked paprika though. Chipotle paste sounds like a delicious substitution! This sounds fab.... I cannot eat capsicums, tart apples and tomatoes, for health reasons, but I'm salivating! Oh I'm sorry to hear that, I'm gathering this is a recent thing? 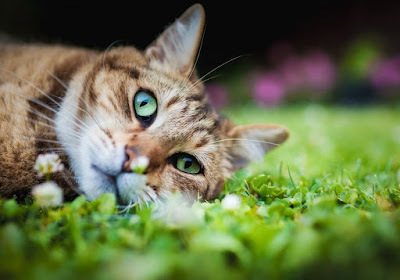 I'm glad you are still able to appreciate the salad from afar, though! 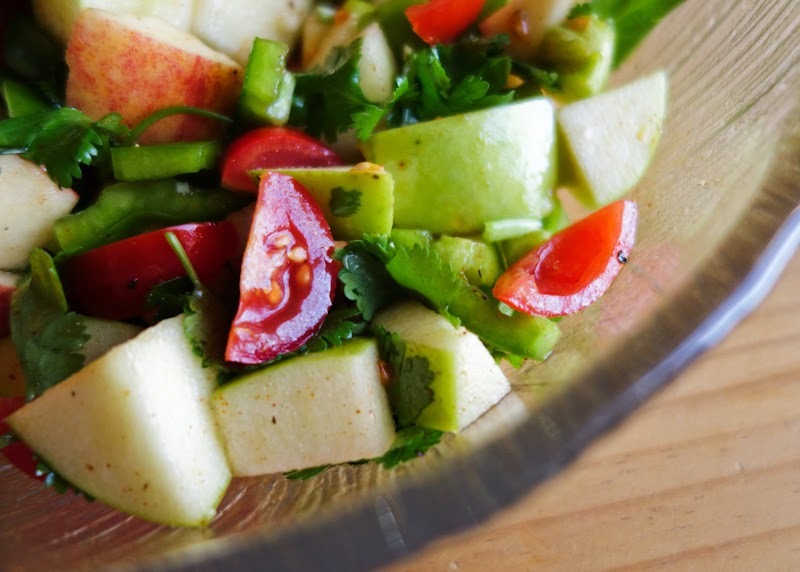 This salad looks great - the apple is a nice addition. The salad is certainly nice and crunchy with the apples!